Schicker Alleinunterhalter. 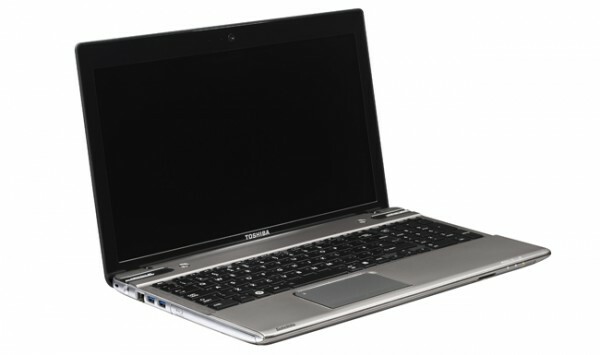 Schon allein die Webseite zum Toshiba Satellite P855-107 weckt Begehrlichkeiten: "Leistungsstarkes und attraktives Multimediaentertainment" ist da zu lesen. Zu viel versprochen? Wir werden es rausfinden. Toshiba’s P855 is a beautifully designed entry into the mainstream segment. It’s certainly one of the better-looking PCs available and, unlike similarly shiny competitors, the finish on this laptop is easy to live with. You can throw your microfiber rag in the trash. Beauty aside, there are some downsides of note. Battery life results were disappointing, to say the least, and the laptop’s more expensive configurations could really use a 1600 x 900 or 1080p display option. The Toshiba Satellite P855 is one of a new line-up of similarly designed laptops, but is the only one to feature a 15.6-inch HD autostereoscopic screen. It will be available in Q2 in the UK, and will cost more than the non-3D P850 - itself weighing in at £599 - but not by much, we expect. The Toshiba Satellite P855 isn’t a big step forward in any respect, but is a respectable mid/high-end laptop. It uses a fairly good-looking aluminium-coated body, has decent connectivity and starts at a reasonable £599, sans 3D. We’re not convinced the glasses-free 3D screen is worth the extra outlay, feeling a little gimmicky, but we’ll be back with the full verdict in our review.